It has been a busy week here: my oldest daughter turned 13 (and her bike got stolen). My husband went to Norway to attend one of the last concerts of this band and I finished a (rather lovely!) project for a book and send it off to where it needed to go. Which is why blogging took a back seat last week but I'm here now because I wanted to share some great recent purchases with you. The big photo in the collage above is from Lucie Summer's book Quilt Improv. I usually go for the classic quilts and quilt blocks and Improv Quilting is a really different approach. I haven't had a chance to read through all the projects yet, quite honestly the font that is used in this book makes it hard for me to read it in the evening, but I'm really inspired to try the different techniques Lucie describes in her book. Lucie's quilts are modern and colourful and I love the bold, geometrical shapes. The freehand cutting of a quarter circle I read about in the book sounds like a proper challenge though. I don't think I will try that on my new Heather Ross fabric (pictured bottom right)! Since shipping costs from the US to Europe went up dramatically (I think I already moaned about that a couple of times here on the blog) I tend to buy more fabric in one purchase but far less often. Obviously I need to choose wisely when I do buy and I think I did well this time! I bought a stack of Heather Ross' latest fabric line Briar Rose and (how sensible!) a bunch of Sketch FQ's as well. Briar Rose does not disappoint, it has a lovely soft feel to it and I'm especially smitten with the Hex Bee and the Cricket Clover print. 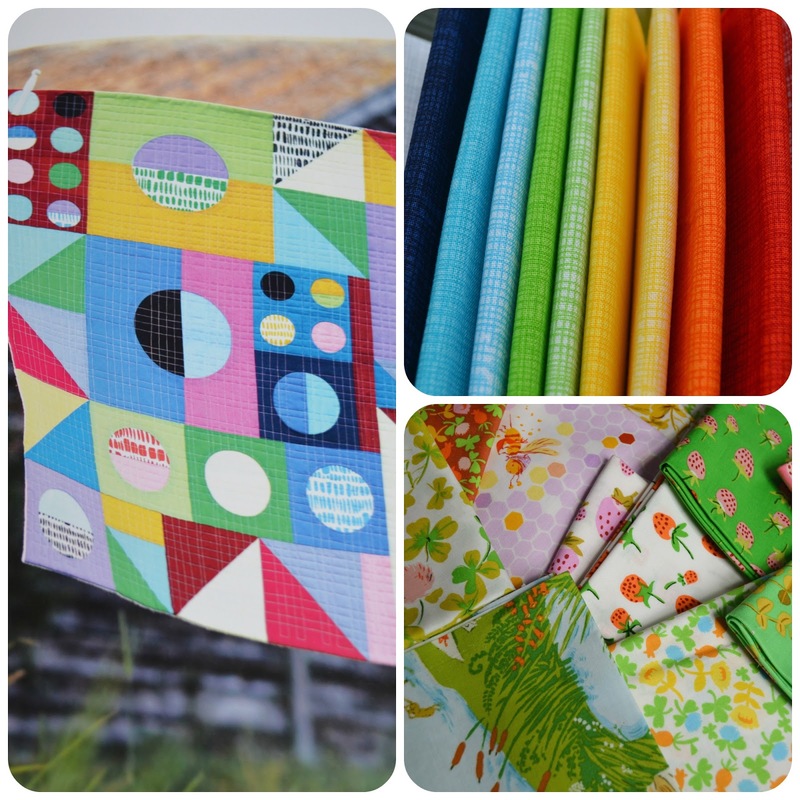 I purchased all fabric in the Westwood Acres shop on Etsy, where I also spotted this FQ bundle. Lush is back and I have a hard time resisting those 'paint-by-number' deers and birds. Another re-release I'm ogling is Belle by Amy Butler. Especially the wallpaper-y prints. I'm still hoping that Katie Jump Rope by Denyse Schmidt one day will be re-released too, I'd buy the 'Bow' fabric in all colours... Which line of fabric would you like to see back on the (virtual) shop shelf?